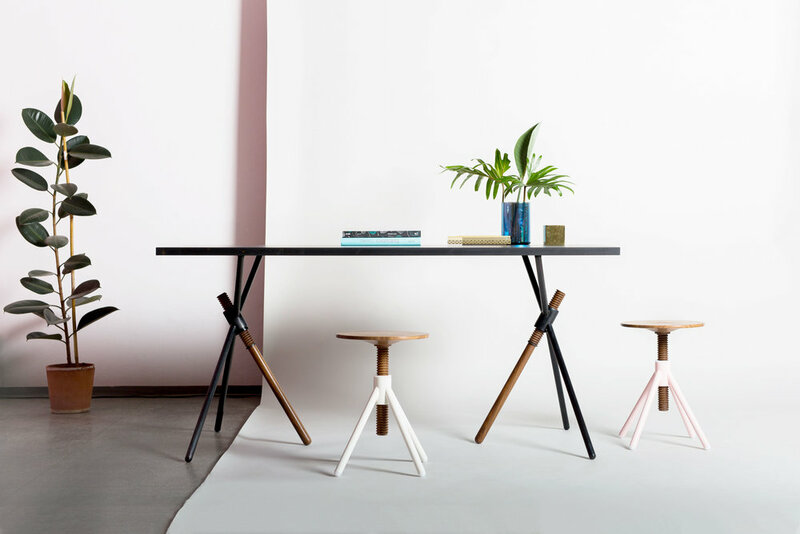 “Thread Family” is a set of small height-adjustable furniture pieces featuring a thread and seat lathed from walnut or oak on a welded steel base available in many colours. The family consists of six members: Small Stool, High Stool, Bistro Table, Garderobe,  Thread X and  Higher Desk. The main feature is the lathed element, consisting of a 40 mm thread cut from walnut or oak, connected to the seat by a visible and well crafted cross-shaped wedge-joint. Its surface is finished with hardwood oil to enhance the natural appearance and to produce a smooth running of the thread when adjusting the seat height. The steel base is welded from precision mild steel tubes, inspired by high quality bicycle frames. Conceived as objects of high flexibility, the “Thread Family” works in small spaces and in large places alike. They rise and adapt to the needs of the user and every piece can become a lifelong companion to a child or an adult. “Thread” emphasizes the natural qualities of wood and works well as a single piece and in a group. The whole Thread Family has now been honored five times: as a “Winner” at the Interior Innovation Award ’14, as a “Winner” at the iF Product Design Award ’14, with a “Special Mention” at the German Design Award ’14, with the “Nominee” at the Green Product Award ’14 and with the “Nominee” at the Designpreis der Bundesrepublik Deutschland ’14. For further requests feel free to contact us at thread@coordination-berlin.com or give us a call at +49 (0)30 2060738800.